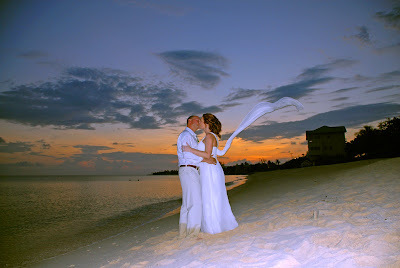 This Seven Mile Beach Bride gets her wish! 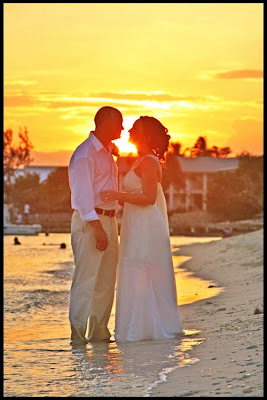 When we were planning this wedding, the bride said she wanted three things, sunset, a private beach and lots of great pictures. 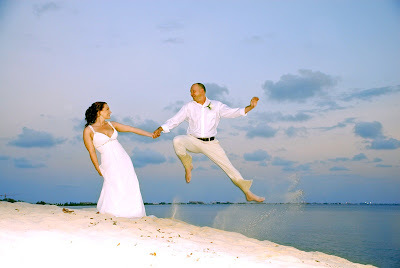 This is one of Fevi's great shots, which she calls the "Peter Pan Jump"! Sometimes the light is just perfect, like these shots below. These are just a few shots of what was an awesome wedding! We helped them enjoy champagne on the beach, and yes...the bride's wedding bouquet of white roses was perfect with her gown...altogether a stand-out event with a great couple!